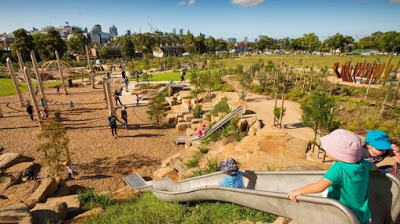 "A Melbourne children's playground designed to encourage risk-taking - through rocky outcropped terraces and lofty climbing ropes - has been crowned the nation's best. It is known as Nature Play and sits in Royal Park, next to the Royal Children's Hospital. ......Built for $5.5 million and opened last March, the park has 1200 trees, gullies, grasslands and a hill with dramatic city views. 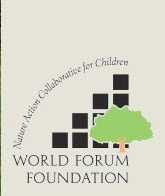 And, to the chagrin of many parents and the delight of their children, the park also includes a water play area encouraging kids to work together to pump and dam water, before finally being released it into a sandpit......Special team wheeling a patient in a hospital bed or wheelchair to the edge of play areas."